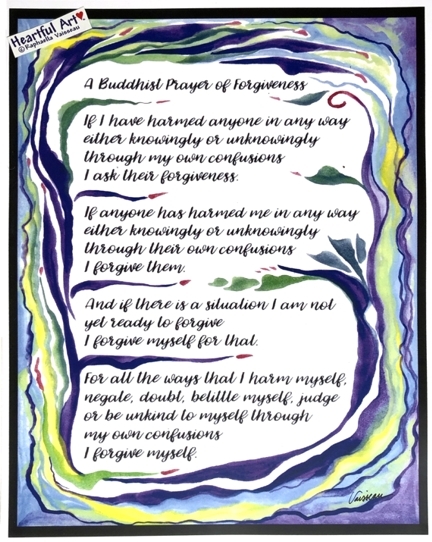 11x14 poster of A Buddhist Prayer of Forgiveness with art by Raphaella Vaisseau. Forgive everything. Forgive yourself, forgive others, God, circumstances, everything. The benefits are taught in churches, temples, hospitals, and books. Forgiveness. A secret of living a life of freedom. Meditate on this prayer. Do it today. NOTE: I ship FAST, usually same or next day. Heartful Art copyright labels that may appear in product photographs are not on the product itself but simply appear on the online image, similar to a watermark. Meditate on this prayer. Do it today.